The true light, which enlightens everyone, is coming into the world. She is in the world, and the world comes into being through her; yet the world does not know her. She comes to what is her own, and her own people do not accept her. But to all who received her, who believe in her name, she gives power to become children of God, who are born, not of blood or of the will of the flesh or of the will of humans, but of God. And the Word becomes flesh and lives among us, and we can see her glory. Which I must say I thoroughly approved of. I'm trying to work out if this makes me an anarchist or a romantic. Possibly it makes me a Christian. I've always had some envy of Quakers who have a strong sense of who their founder was - George Fox - and all Quakers know that and still talk about Fox. Unitarians have less of a sense of a founder, and this gives us less of a sense of identity. Recently though I've started to read more about Michael Servetus. And I've started to really warm to the idea that he is our founder, and should be viewed as such. True, he didn't start a community, but then, neither did Jesus. True he wasn't perfect, but then, neither was Jesus. I've recently gained more insights into Servetus that I didn't appreciate before. He was an ethnic minority as a dark-skinned Spanniad in France. He was a healer as he worked as a doctor. He read the Qur'an, and possibly read Arabic, and had a very positive approach to Jews and Muslims. He suffered a death for what he believed in, much like Jesus and Al Hallaj. But mostly I love his mysticism, his sense of God within, that I'm beginning to think is the very essence of Unitarianism. This is the great mystical strand of Unitarianism that we've lost too much. It's just as important as the rational side. I think we're very impoversished when British Unitarians only trace ourselves back to Priestley and Lindsey, and Americans only trace themselves back to Channing. 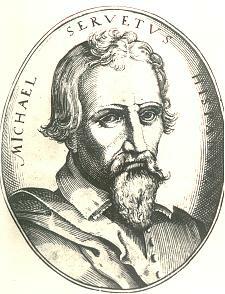 I think we're a global family with many branches that starts with Michael Servetus. Right now I feel like being Unitarian means following Servetus.